A number of successful projects has proven the advantages offered by geosynthetic reinforced soil technology, which provides engineers with an efficient, environmentally friendly alternative to bulky reinforced concrete. We hope that the market’s enthusiastic response will now be followed by government support in boosting R&D and creating regulatory documents in this field, aiming to achieve international standards for the Russian construction industry. In 2012, we won the prestigious GE “Best International Project of the Year” for our construction of geosynthetic reinforced soil structure at a new airport in Pakyong, in quake-prone northeast India, using Terramesh®. At 74 m, it is the highest project of this type in the world, and it proved to engineers around the world that enhanced soil projects of this type could be built effectively and efficiently. Soil reinforcement technology provides solutions to several complex engineering issues, such as weak soil, building in an area with hazardous geological conditions, or designing with unlimited height. This technology has been actively employed in Russia since the early 2000s. 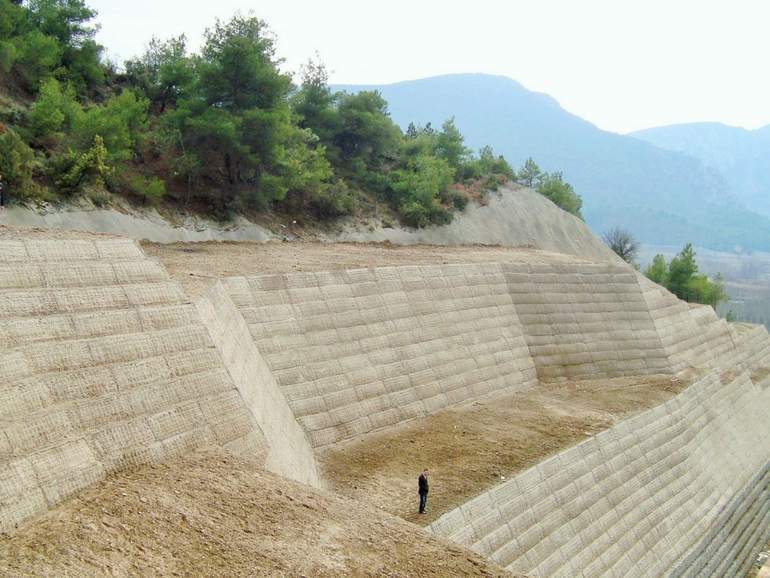 Maccaferri Russia was one of the first companies to regularly implement soil reinforcement, and since 2001 we’ve completed over 800 structures with this technique, in a variety of different climates and seismic areas and with an array of heights. One of our most successful projects has been the 33 m high supporting wall near the coarse crushing tower at the Mikheev Mining and Processing Plant in the Chelyabinsk region, designed to hold the weight of 350-ton dump trucks. The benefits have been proven, and soil reinforcement is being increasingly used in Russia competing with traditional reinforced concrete walls, which can cost 30-50% more than geosynthetic reinforced soil. We hope that the market’s enthusiastic response will now be followed by government support in boosting R&D and creating regulatory documents in this field, aiming to achieve international standards for the Russian construction industry. For more information on our Reinforced Soil Solutions, please contact us.